Billiards was first played in Sulgrave in the early 1920s, when a group of young men met together at the old parochial hall under the benvolent supervision of the Vicar at the time, the Reverent Pakenham-Walsh, who not only provided the two six feet billiard tables, the billiard cues and balls, but taught the basic rules of the game as well. Committee Messrs. Walter Cleaver, Arther Seeney, Bill Branson, Bill Henn, Fred Golby, Eric Constable, Stanley Adkins, Len Parker. The members' subscription for the season was fixed at one shilling, plus a further shilling as a voluntary payment to build up funds, a set of club rules, drawn up by Walter Cleaver, was approved, and the Club officially opened on 7 October 1926. The first game of '200 up' was played between C.H.Godfrey and J.P.Brown, and the second between the vicar and Walter Cleaver, but there is no record of the scores. The members's subscription list for the 1926/27 season show that the club was divided into two sections, Married Men and Single Men, with fourteen subscribers in each section. Members had to be over 23 years of age. Initial subscription was one shilling, plus a weekly amount of sixpence, payable in advance. Any member defaulting in his payments for four weeks would be automatically excluded from the club. A quorum of five committee members would have the power to refuse membership to any applicant whom they deemed undesirable. 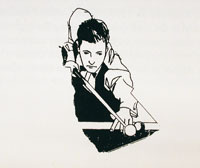 A billiard table, balls and cues were purchased, the interior of the Reading Room was cleaned and painted, floor covering and window blinds were fitted, various members were made responsible for cleaning and dusting the room and lighting the fire each evening, and this new club got underway. There is no record of the original club after 1930, so it would seem that it was merged with the new club around that time. In 1932, Miss Morgan Griffiths presented a silver cup to the club for yearly competition by the members, and, in that same year the Eydon and District Billiards League was formed. The delegates appointed to represent Sulgrave at the ensuing League meetings were Fred Golby, Bill Henn and Percy Parker, with Fred Golby as team captain. A second silver cup was presented in 1934 by Major Colledge, to be competed for on a handicap basis, each game to be up to a total of 125 points, with an entrance fee of two pence, the total of which was to be put to purchasing a prize for the runner up. From 1927 to 1939, while he was President of the club, Mr J.P.Brown provided the electricity from his home at Sulgrave Court to the Parish/Reading/Billiard Room free of charge, at which later date the Northants Electricity Company installed a direct supply to the premises. The accounts of the club for 1939/40 show that the cost of the installation was £2 and 7 shillings, and the first quarterly bill was four shillings and fourpence. The Parish Room was partially commandeered during the war years by the Civil Defence, so the club's activities were somewhat restricted until 1945, when it reopened fully with Reverent Pakenham-Walsh and Fred Golby as President and Secretary respectively. 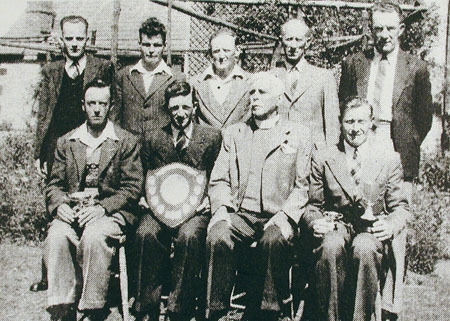 The Eydon & Distric League resumed in 1946, and, in the 1947/48 season the club achieved the frist of its many subsequent successes in winning the League Shield as well as the Individual Cup, won by Aubrey Belcher. To celebrate this feat, a dinner was held at the Six Bells public house on 9th April 1948, the cost of the meal was three shillings and sixpence, and according to the records, "the chair was taken by Major F.A.Magnay, 47 members sat down to an excellent repast, the various (?) were honoured, and the entertainment side was well catered for by Mr Brooks and Mr Clifford from Oxford". 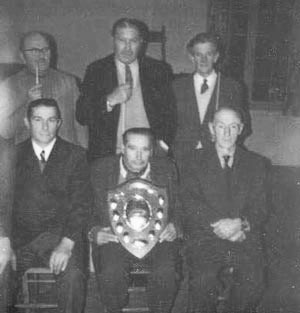 The Croughton and District League was formed in 1950, the club immediately applied to enter a team, and Bill Henn was appointed secretary and captain in November of that year, and the strength of the club at that time was such that finally two teams were entered to ply in this new league. In 1954 the Reverent Canon Pakenham-Walsh retired as vicar of the parish, and, at the Annual General Meeting in May of that year a special ceremony was held to mark the immense contribution he had made over the previous thirty years, not only as President and a keen player in his own right, but also in teaching so many others how to play the game. Bill Henn succeeded the vicar as President, and he held this office (combining it with that of secretary in 1962) until his retirement in 1986, when it was revealed that he had held an office in the club for some sixty years. A further trophy was acquired in 1957, when Canon Pakenham-Walsh donated a silver cup to be awarded to the club member making the highest break during league matches and the individual championships and trophy competitions. The first winner was Aubrey Belcher, who received the cup from the Canon when he was the guest of honour at a buffet supper at the Thatched House Hotel, where fifty members and friends attended. 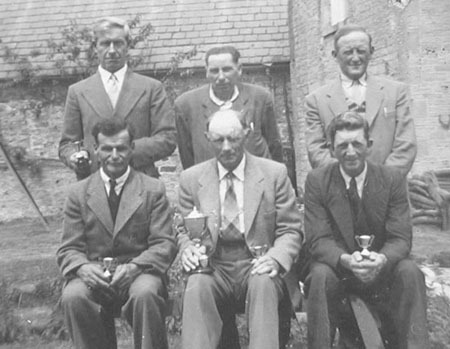 The strength of the club continued to improve, and, in 1959 was able to enter "A" and "B" teams in both leagues, the "A" team going on to win the Croughton & District League Cup in 1961, when Aubrey Belcher also won the Individual title. Yet another trophy was donated to club in 1966, when Mr H.C.Avery gave a silver cup for a summer handicap competition, the first winner of which was Fred Golby, and, in 1977 Mr and Mrs Harvey gave a further cup to be awarded annually to the most consistent player in league matches. In the forty seven year period from 1947 to 1994, the club has achieved many successes in the two leagues in which it has competed, winning league titles on no less than seventeen occasions, as well as nine individual cups and various other trophies awarded by the two leagues. The membership hs greatly reduced in recent years, perhaps due to the ease of travel for prospective members to pursue interests further afield, but the present players still represent Sulgrave in both leagues, and never fail to give a good account of themselves in the competitions.